October 29, 2010 Jack M., Friends Jerry & Cheif Have a great Fall Trip on Big Lake!!! October 29, 2010 Jack M., Friends Jerry & Cheif Have a great Fall Trip on Big Lake!!! They called about a Spring Trip but when I told them that NOW was the best time to fish they came on down and even though 25 MPH winds made it a challange live shrimp under a cork filled the cooler with a nice mess of Lake Calcasieu Trout & Reds! And they will be back in April! 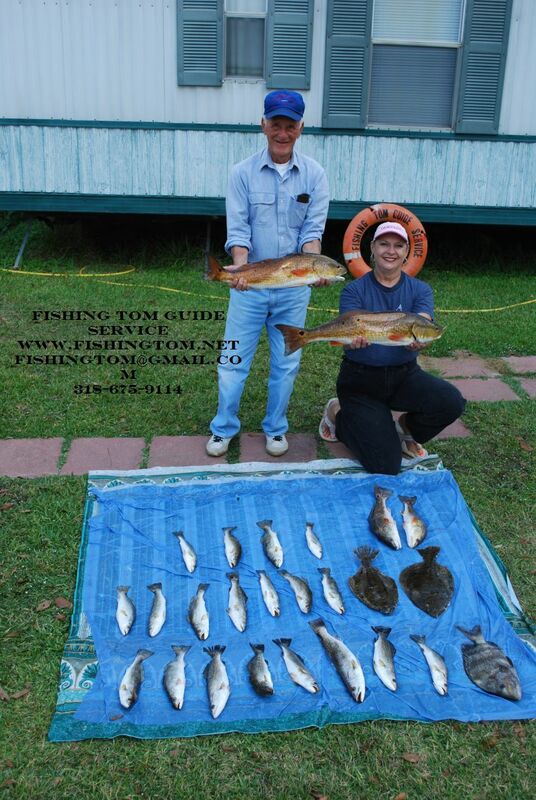 October 24 2010 Buddy H. & Sons Matthew and Jonathon Find FlatFish Fun on Lake Calcasieu!!! 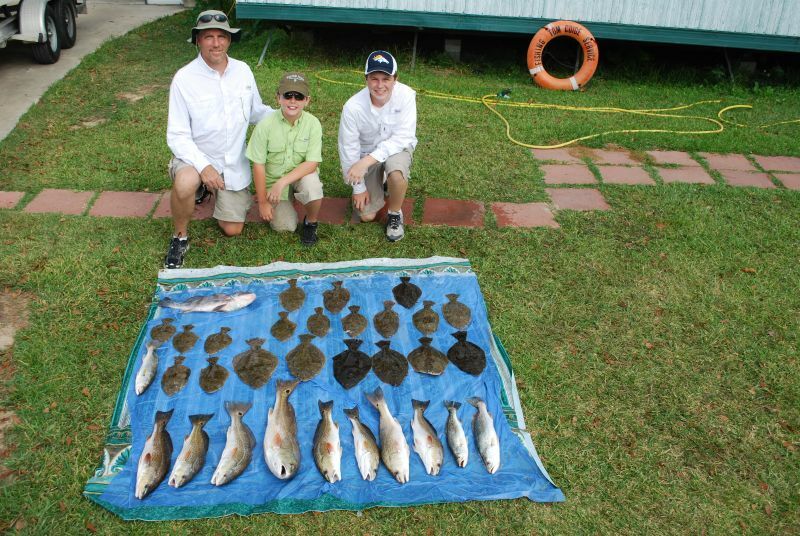 October 24 2010 Buddy H. & Sons Matthew and Jonathon Find FlatFish Fun on Lake Calcasieu!!! Hi winds and muddy water greeted us at our first stop but we were hopefull the fish would still bite , and they sure liked live shrimp under a cork. Mathew boated a nice 3 pound black drum on the first cast and a minute later Buddy had a nice Big lake Trout on the line. Then slowly but surely we filled the boat with nice Calcasieu Flounder u Flounder was Jonathon’s request as his favorite! 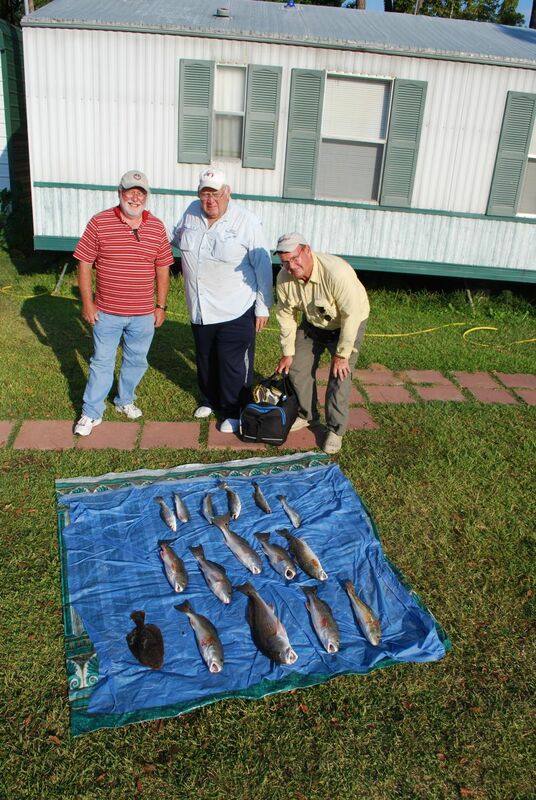 October 21, 2010 Uncle Hank Stay’s for Day 2 on Lake Calcasieu!!! 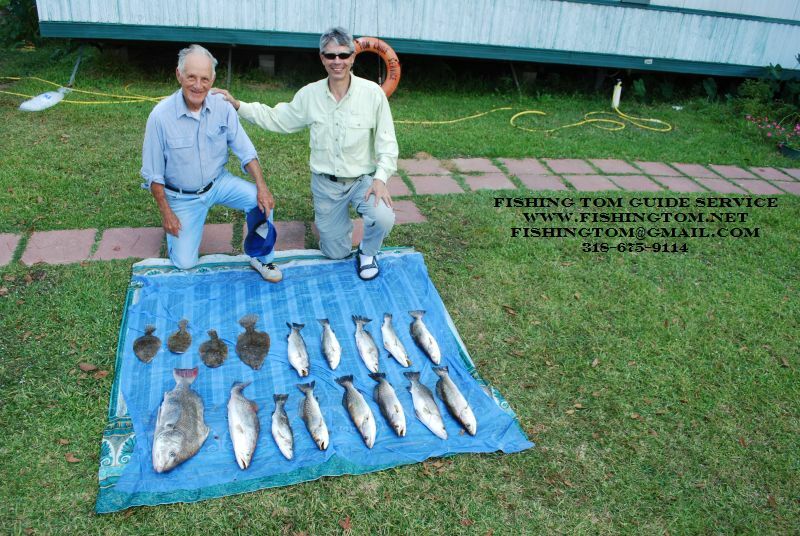 October 21, 2010 Uncle Hank Stay’s for Day 2 on Lake Calcasieu!!! Today we worked some birds and banks with Gulp Shrimp and Uncle Hank still managed to put some Dandy Lake Calcasieu Beauties in the boat. Not Bad for 83 years old!!! October 20,2010 Leightom M. & Uncle Hank Catch The Big Ones On Lake Calcasieu!!! October 20,2010 Leightom M. & Uncle Hank Catch The Big Ones On Lake Calcasieu!!! Berkley Molting Shrimp was the bait of choice for catching these 2 pound plus beauties on Big Lake today. These guys wanted only quality fish! No Birds or schoolies. So we worked some deeper areas with gulp shrimp and caught this nice group of 19 to 23 inch trout. And Uncle Hanks 5 pound Drum !!! October 19,2010 Jim H. & Friends Butch and Harry Work Hard for Some Big Lake Reds!! 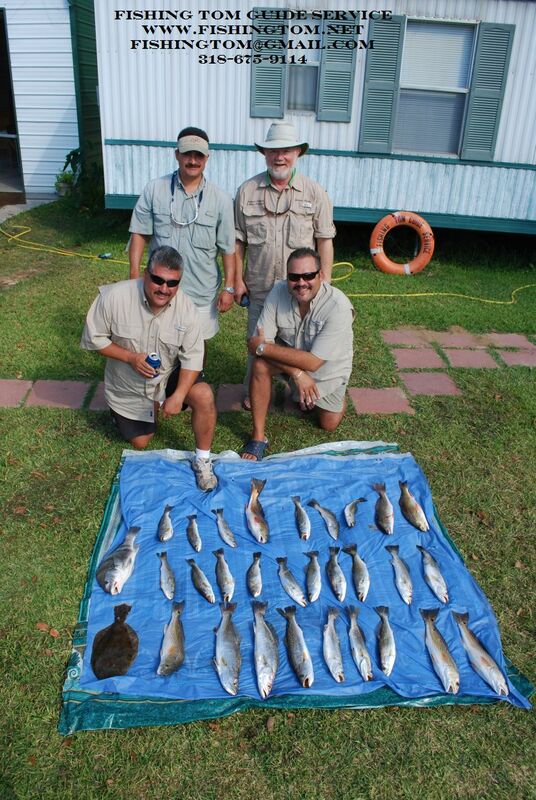 October 18, 2010 Albert G. & His Fishing Buddies from Texas Catch Some Nice Big Lake Beauties!!! 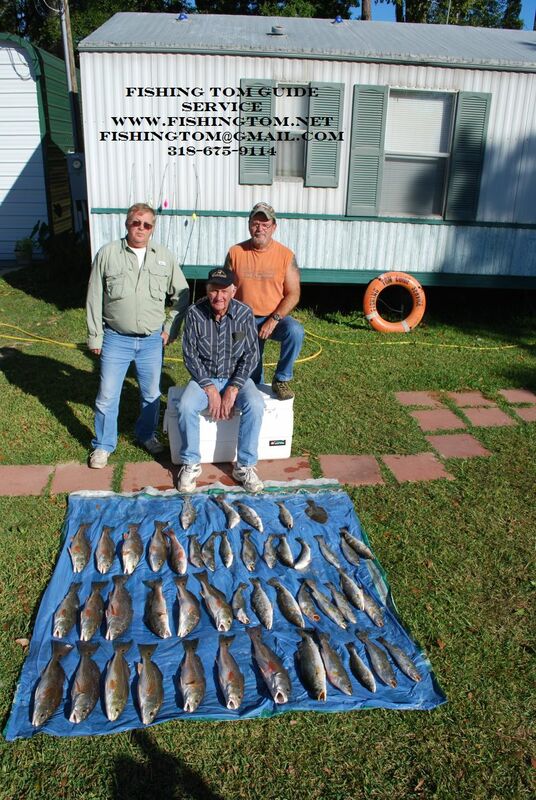 October 18, 2010 Albert G. & His Fishing Buddies from Texas Catch Some Nice Big Lake Beauties!!! Live Bait and Berkley Gulp helped these guys put a nice mess of Big Lake Specks & Reds in the cooler!